In gathering background information by talking to family, caregivers, nurses and management, a common observation was that the residents had nothing to do. There was consensus that there should be more programs in the activity calendar and most people suggested that there should be more entertainment and social events. Good observations, but implementing change is not that simple! Each individual resident needs to have “things to do” that are meaningful and beneficial to them. There is no one size fits all solution. It requires everyone in the circle of care to take responsibility for the well-being of the residents and to ensure that they are receiving the appropriate level of engagement. To make the biggest impact in the shortest time, a recreation schedule was established to provide many opportunities for the residents to participate in small group programs throughout the day. 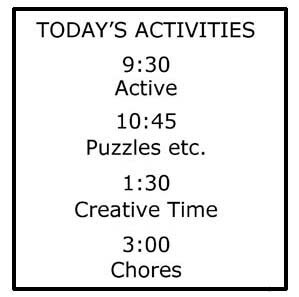 By having a published schedule, these activities could develop into a routine on the unit, anticipated by both staff and residents. By offering programs at the appropriate time of day for the type of activity and ensuring that the program meets the objectives for each participant, a good start was made in engaging the residents. From that outline, a weekly schedule of activities was developed, with a different activity for each day of the week in each of the categories. This allowed sufficient variation that the same schedule could be offered every week. It also gave staff and residents something to anticipate – Wednesday morning is Ball Toss, Tuesday afternoon is music. Program Sheets were prepared for each program describing how to present the program, its benefits, how to judge its success, and so on. The materials required for each activity (also listed on the Program Sheet) were gathered up and organized and stored so they were easy to select and return to the same location after use. Next, the care plans for each resident were reviewed and updated with the goals and strategies appropriate for the resident. 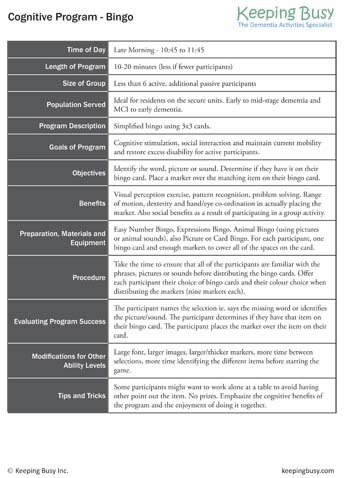 From the care plans, it was determined which of the programs would be most beneficial for each resident – that is, which would meet the needs identified in the care plans, consistent with the strategies and goals for the resident. The basic daily schedule was posted in a prominent location for all to see and reference, and a list specific programs for each day of the week was posted in the nurses’ station and circulated to family. The routine of the schedule was a comfort to residents because of its consistency as well as providing opportunities for engagement throughout the day. Staff recognized that it made their day better as well. The support of the Administrator and Director of Nursing was an important factor as they made the recreation worker accountable for presenting the full schedule of programs and performance was evaluated weekly by reviewing the resident participation report and comparing the actual statistics with the goals for each resident. Establishing the recreation schedule and making it a routine was a positive first step in the pursuit of excellent care for the residents with dementia on the secure unit. It established a minimum amount of programming each day while freeing up time for recreation staff to pursue other responsibilities.